The Leica X-E (Typ 102) is a 16 megapixel compact camera with an APS-C sized, 23.6x15.8mm CMOS sensor with a 3:2 aspect ratio, image-stabilized Leica Elmarit 24mm f/2.8 lens provides a focal length of 36mm in 35mm terms, and a 2.7 inch LCD screen. The X-E (Typ 102) has both a pop-up flash and a hot shoe, and it offers a full range of advanced controls from manual exposure to manual focus. Other key features of the Leica X-E (Typ 102) include an improved autofocus system, a sensitivity range of ISO 100-12,500, maximum shutter speed of 1/2000th of a second, JPEG and DNG RAW file support, and a continuous shooting rate of up to 3 frames per second. 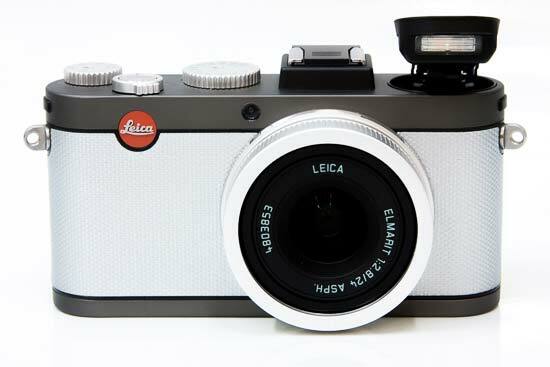 The recommended retail price of the Leica X-E (Typ 102) is £1250 / $1795. There's no getting away from the fact that the Leica X-E (Typ 102) is identical to the older X2 camera, which we reviewed way back in 2013. Consequently, most of the comments that we made about that camera apply equally to the new X-E model. 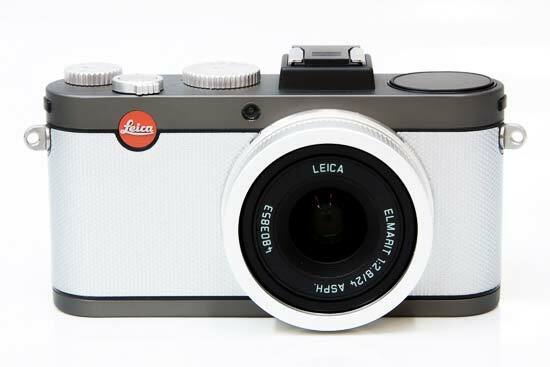 The only thing that has changed about the Leica X-E (Typ 102) is its cosmetic appearance. Instead of the all-black or silver/black versions that the X2 was offered in, the new X-E has a dark grey / silver colour scheme, with the silver band that runs around the camera having a dimpled texture. 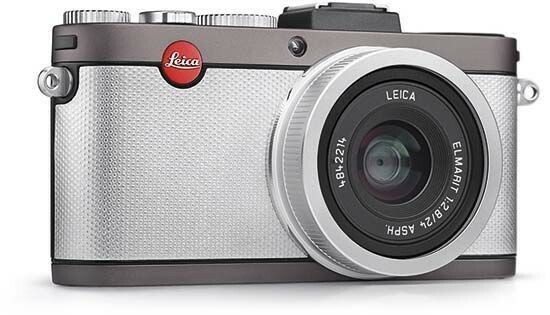 The Leica X-E (Typ 102) has a 16.5 megapixel CMOS chip, boasting an effective 16.2MP. This pumps out a purported 16.2-megapixel effective resolution. As with the X2 though, the provided 24mm f/2.8 lens on the front (36mm equivalent in 35mmm terms due to the 1.5x crop factor at play here) cannot be detached or swapped. However it is a Leica lens, an indicator of quality worn as a badge of pride when licensed to other manufacturers, including Panasonic. And there is the ability to incrementally alter aperture from f/2.8 to f/16 via the dedicated top plate dial. 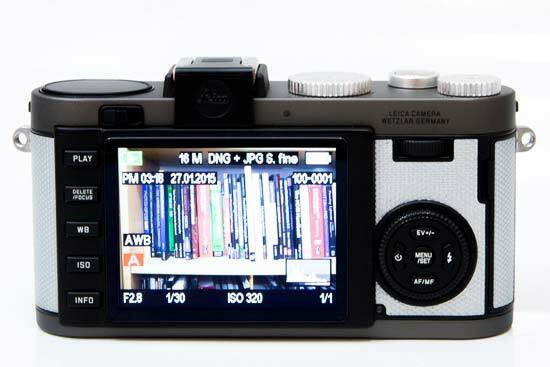 As a result, and this was also true of the X2, the X-E's looks mirror its maker's rangefinder cameras, such as the M9. As well as two rather stiff top plate dials via which manual adjustments can be made to shutter speed (from 30 seconds to 1/2000th of a sec) and the aforementioned aperture there is a disc-shaped flash neatly sunk into the top plate. Spring-loaded, it leaps forth with a thumb-shove of the manual catch provided top left of the back plate, its minimalist appearance adding to the camera's cachet of cool. Naturally there is a vacant hotshoe for accessory flash too, to which can alternatively be attached Leica's lovely optical 'Bright Line' viewfinder for around £269 or an EVF 2 electronic viewfinder if preferred, which will set you back around £360. Yes, admittedly that last price would buy you a high-end compact with a 1/2.3-inch sensor outright, but such a camera is not quite in the X-E's rarified class. Something of a specialist tool for those more used to shooting reportage style - due in part to being more portable than an SLR - as with the previous X2 the X-E doesn't feature anything as frivolous as a video mode. Likewise the size of the back plate LCD remains a relatively modest 2.7-inches, plus the resolution - in the absence of any provided viewfinder out of the box - stays fixed at a lowly 230k pixels. We might have expected a screen size and/or resolution hike this time around - but we haven't got it. The actual price of the camera is £1250 - about a 10% reduction from the X2, and without optional attachments, which makes it almost as much as a full frame Canon EOS 6D, to put it into perspective. On the plus side the Leica also comes with a two-year warranty as opposed to the usual one, a year's accidental damage cover, and a download option for Adobe Lightroom, with code provided once the product has been registered. As with the X2, the fact that we don't have a zoom to play with here prompts a more considered approach to picture taking, in that the photographer has to physically step forward or back to alter what's included in the frame. You also have to get up close to and interact with your subjects; a camera for surreptitious candids this is not. Leica claims that the 24mm lens was chosen because it's a classic length for photojournalism, with minimum focus distance remaining at 30cm. Sounds unremarkable, but in truth that's as close as you'd probably want to get to anybody unless you were puckering up. From the outset the X-E immediately seduces, even if it does look rather minimalis. Still, this does mean that the (in)famous red Leica badge and logo stands out due its position top left of the lens, hard plastic clip-on cap provided as protection for that renowned glass. Just right of the badge, if viewing the camera front-on, and nudging closer to the lens surround, is a small porthole containing the traditional AF assist/self timer lamp. Between top and bottom of the faceplate there is also a wide band of studded padding that is largely there for show than serving as a practical form of grip. In fact there is nothing resembling a traditional handgrip provided with the camera at all, though there is an optional accessory grip for just under £100. Having said that, the solidity and weight of the X-E's build - a heavier than average for a compact 345g with battery - means that it didn't feel like the Leica would suddenly slip from our grasp at any point. The lens ring itself also has a ridged edge, which provides something to grip with your left hand if wanting to hold the camera steady - whilst making sure fingertips aren't straying in front of the lens, of course. It can also be unscrewed for the threading on of attachments. The X-E's top plate meanwhile features most of the attributes we've already touched on, such as the pop up flash, hotshoe offering full compatibility with the Leica SF 24D and SF 58 system flash units, aperture and shutter speed dials, plus the on/off switch that ergonomically encircles the shutter release button. This isn't just a power switch however as the two 'on' settings provided here directly alternate between single shot ('S') and continuous shooting ('C') options (3fps or 5fps to a maximum 8 shots) - so you've always got these drive modes literally at the tip of your forefinger. 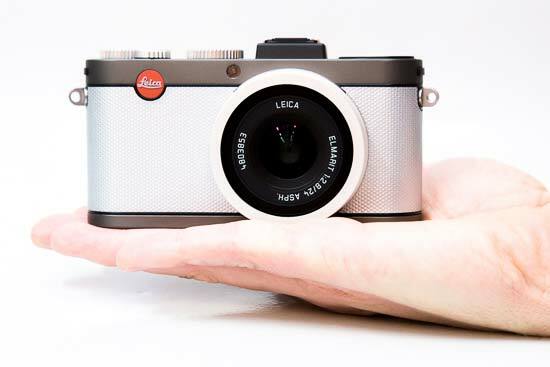 Flick the switch to 'S' or 'C' setting and the Leica readies itself for action in 2-3 seconds, lens extending from flush with the lens surround to stand proud by just over an inch whilst the rear screen bursts into life. Squeeze the shutter release button in single shot mode to take a maximum resolution 'Super Fine' JPEG and the screen displays the resultant image for what seems like a slothful five seconds. Take a top quality JPEG and Leica's 'DNG' file version of Raw and the camera isn't any noticeably slower however. Plus the advantage of the DNG format is that it can be opened directly by Photoshop without specialist conversion software required. Though the auto focus occasionally hunts to find a target, overall it's quick to lock onto and determine focus and exposure. Media of choice is the expected 'all varieties of SD card' whilst the unit also comes with 110MB of internal memory out of the box. 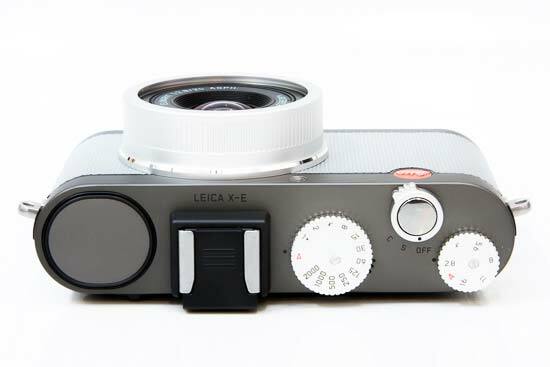 The back of the Leica X-E (Typ 102) features the aforementioned switch for raising the flash over at the left hand side, whilst a command dial sits over at the top right. With the 2.7-inch LCD screen taking up a little less than two thirds of the back plate, this has left room for a row of five function buttons ranged vertically down the left hand side of the screen, whilst over at the right hand side sits a familiar cross key/command pad style arrangement, encircled by a scroll wheel. Rather than the latter providing a faster means of scrolling through captured images however, a clockwise turn enlarges a portion of a captured image, whilst an anti clockwise spin presents up to 16 thumbnails on screen at a time. The buttons at the left of the LCD are both clearly marked and instantly comprehended. From the top we have a 'play' button for reviewing previously captured images, whilst next up is a combined delete/focus button. The 'focus' element comes into play once the user has switched from default auto focus to manual focus via a press of the AF/MF button placed at six o'clock on the cross key arrangement; whereby a central portion of the image is enlarged - as when using live view on a DSLR for manual focus - and a sliding scale of between 0.3 metres and infinity (and the same distance given in feet) provided to adjust the focus range accordingly. With the smaller screen scale and lower resolution we found it trickier to accurately determine pin sharpness than we might have liked, but at least the function is there. Alternatively if leaving the camera to its own auto focus devices the user has a choice of a single point AF, a DSLR-like 11-point AF, spot or face detection AF settings. In addition, it's worth mentioning that a press of the delete button immediately brings up the option to delete one image or all, with your choice highlighted by a black overlay on an otherwise dark grey background. As conventional wisdom usually has it that a lighter colour highlights the menu option in play - rather than black, as here - we were brought to the threshold of accidentally deleting all images on several occasions until we got used to this bucking of tradition. The next button down on the backplate strip of five is for manual white balance adjustments, and here, in addition to automatic, the usual suspects are provided: tungsten, fluorescent, flash, (daylight) cloudy, (daylight) shady, along with the ability to take your own white balance setting. The button directly beneath governs ISO settings, with here the range going from ISO100 to a top end ISO12500, presented as with the previous setting as a toolbar overlaying the right hand side of the screen. The bottom button of the row of five on the X-E is similarly self-explanatory being labeled 'info', though in truth it's function is closer to that of a standard 'display' button rather than providing the on-board manual its name might suggest. A press of this in capture mode removes icons for the shooting mode in play, number of shots remaining, battery life, focus and metering mode from the screen to provide a clear view of the subject, whilst a further press brings up a nine zone compositional grid for which to practice our Rule of Thirds. Moving to the set of cross keys on the right of the screen, at twelve o'clock we find an exposure compensation button, with adjustable settings ranging from a standard -3EV to + 3EV. Subsequent presses call up a further exposure bracketing option across the same incremental steps, plus flash exposure compensation. Moving clock wise through the cross keys, and at three o'clock we find a button governing the more comprehensive than usual flash settings. These cover: auto, auto with red eye reduction, forced flash on, forced on with red eye reduction, slow sync, slow sync with red eye reduction, plus a fairly blinding (yet effective) studio flash option for triggering external slave flash units. The next button that comes into play is the already covered auto/manual focus button, while the last of the four options is presented in the self-timer control. This throws up an option of two seconds or 12 seconds, and that's it. In the centre of these four buttons we find perhaps the most important of all the controls on the camera back - namely the menu button. As we'd expect this is where the nitty gritty of the camera's operation is decided and acted upon. Naturally enough it's here that we choose the camera's resolution, with options ranging from 1.8 megapixels all the way up to 16 megapixels, plus opt for a level of compression. The JPEG options are either JPEG fine or the optimum 'super fine'. Then there's the chance to pair a super fine JPEG with a DNG file, or a fine JPEG with a DNG file. We don't then get the opportunity to shoot Leica's version of Raw on its own. Also via the menu screen's we can select the camera's metering modes, with multi field metering, centre weighted metering and spot metering all offered up. Further options include the ability to turn image stabilization on or off, individually adjust sharpening, saturation and contrast in camera - with the default setting being 'standard' and the other alternatives ranging from 'low' to 'high'. Interestingly we also get 'preset film' options ranging from the default standard through vivid, natural, black and white natural and black and white high contrast. Whilst the left hand flank of the X-E is devoid of features save for a lug for attaching the strap, the right flank features a flip open door protecting two ports: one a five pin mini USB socket and the second for HDMI output. The base of the Leica X-E meanwhile features a marginally off-centre screw thread, with a large catch protected compartment housing both the supplied BP-DC8 lithium ion battery and port for optional removable SD media alongside it. The battery is good for around 260 shots according to the manual and claimed CIPA standards (although the initial press release claimed 450 shots), from a full 200-minute charge, which is hardly that impressive compared to a compact system camera for less than half the price or even a DSLR for a comparative cost which will deliver four times as many images.